The Grundig G1000A will insures that you will never be out of touch. Compact, yet powerful the G1000A receives AM, FM and eight shortwave bands (see chart below). 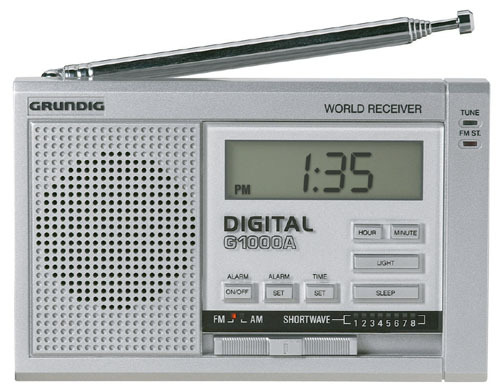 The G1000A is easy to use with an analog tuning knob on the right side of the radio. 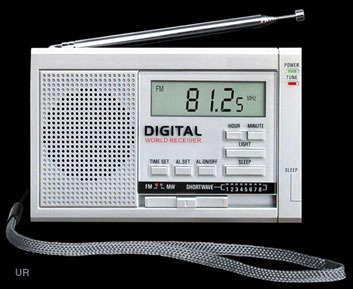 It features a backlit digital display, radio alarm, sleep function and stereo headphone jack. Comes with protective black case, two AA cells, Grundig Shortwave Listening Guide and stereo ear buds. 4.5 x 3 x 1.125 inches. 7 oz.